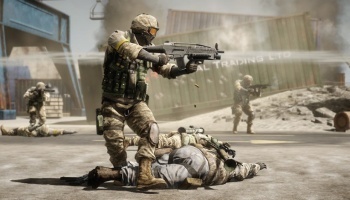 Think that Battlefield: Bad Company 2 will be all about the "modern warfare" all the time? Think again. According to the ESRB explanation of the game's "M for Mature" rating, BFBC2 will actually start out during the Pacific Campaign of the Second World War before jumping through time to the modern day: "In single-player mode, players conduct missions on an unnamed Japanese island during World War II and then move into the modern day through jungles, deserts, and snowy terrain." One can't help but wonder if the WW2 missions will tie into the game's plot somehow, or if they're just there because Dice was all "Oh hey, we still like WW2, let's put something in there." The ESRB explanation also contains this little tidbit about the game's M rating beyond the standard violence, swearing, etc. "There are also close-up depictions of knife-stabbing (flesh-impact sounds) and melee attacks with a power drill." Okay, I think I'm just about sold on the game now. Power drill melee combat? That's kind of awesome. Still can't get the beta to work on my PC without swapping constantly between a psuedo-windowed mode and full-screen. Ah well, if the beta doesn't have the drill combat maybe it's for the best.